Homepage » HowTo Guides » How to Download UC Browser for PC? You might be well aware of UC Browser as it is one of the best and most popular browser that is used to surf the Internet on mobile devices. It gives you super fast speed when surfing from your mobile phone but do you know that you can use UC Browser for PC as well and enjoy good speeds on your computer? UC Browser is mainly been developed for mobile phones only but because of the great performance, users only wish that they could use it on your computer as well. Now they can use the browser on their computer too as here is one method to do it. There are many people who want to download UC Browser for PC and use it to surf the net so here are 2 methods that you can use to run UC Browser for PC. How to Download and use UC Browser for PC? To download UC Browser on your PC, you must follow all the steps that I mention below as we are going to use an emulator to get the browser working on our computer. 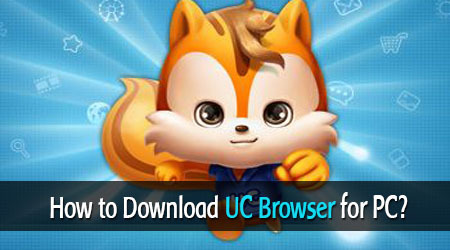 So here is the step-by-step instructions to download UC browser for PC. After downloading it, install it on your computer. Once the installation process is over, run the BlueStacks app player. Now search for “UC Browser” in the search box in the BlueStacks app player. You will get the results, now click and install UC Browser from the results you get. UC Browser will be installed on your computer. You will now be able to see an icon of UC Browser on your computer’s desktop, which means it is installed. Now you can use UC Browser for PC and surf the Internet at fast speed. Read: Why Android Enjoys a Lot of Popularity Over Any Other Mobile OS? With this method, you will be able to get the English version of UC Browser for PC. But if you don’t want to install an Android emulator like BlueStacks on your computer and need a direct download link to UC Browser then read on the second method. If you are not too keen to install one other software on your computer to help you install UC Browser on your computer, then this might be the solution you are looking for. You can directly download UC Browser for PC and install it without any extra software or emulator. The download link for the same is given below. The UC browser that you will download from the above link will be in Chinese language. You don’t need to install it. Just download it, extract the contents of the file and double-click on the .exe file to run the browser. But the only drawback of this method is that it is in Chinese language. So I would recommend you to go with the first method of using the BlueStacks App Player to download UC Browser for PC. If you are using Windows 8, then you can download the browser directly from the link below and it support English language along with Chinese language. I hope that you might have liked the article on how you can download and install UC browser on your computer and surf the web using it. I shared with you 2 best methods that you can use to download UC Browser for PC and I would suggest you to use the first method as it is the most used method and you won’t face any troubles using it. Read: How to Install Flash in Chromium Browser for Ubuntu? Do share your views on the article and whether you liked using UC Browse for PC and how was your experience compared to other web browsers!